Ultra White Collar Boxing is the biggest and most well-known white collar boxing organisation in the UK. Their events are held at most major cities at least twice a year, and they've been running these for years now—it shows, they know how to put on a great event. Their website features a range of useful information on the history of white collar boxing, as well as details on how to sign up (a straightforward process) and what you'll need. Myself and two friends committed back in November 2014. We all loved our boxing as fans, but we'd never stepped foot in a ring—let alone sparred—and had no formal training in terms of boxing technique. What started as pub talk became a reality as we signed up online and received our confirmation emails and texts inviting us to the introductory meeting. This page contains affiliate links to Amazon.co.uk — if you click on one of the product links and decide to make a purchase, I'll get a small kickback. Using these links in no way changes the price of the item. Together/Ben Lee-Gleadall is a participant in the Amazon EU Associates Programme, an affiliate advertising programme designed to provide a means for sites to earn advertising fees by advertising and linking to Amazon.co.uk. Amazon and the Amazon logo are trademarks of Amazon.com, Inc. or its affiliates. Competitors are required to sell 20 tickets each, either through VIP tables (£50 per head for 10 people, ringside with a meal included) or standing tickets (£20 per head) or any mix of the two. I'd absolutely recommend selling as many as possible, as on the night it's a huge boost to have the audible support in the crowd. Tables could be reserved for £150 with the balance paid a week or so before the fight — these are limited and do sell out fast, so reserve one early on if you think you can fill it. We eventually sold 4 between us which the organisers kindly put next to each other. One of the few things I'd change was purchasing standing tickets — these had to be bought in books of 10, and dropping £200 in advance then trying to get the money back was a pain. UWCB had also disabled ticket sales on their website for part of the 8 weeks, which meant buying 10 was the only option. That said, nearer the fight there were several fighters selling spare tickets, so it wasn't a big issue. Goes without saying really, but you're expected to attend as many of the 16 training sessions as possible. I'm glad I did — both the mid-week fitness/technique sessions and the Sunday sparring sessions were invaluable. The match-ups on the night, I thought, were done really fairly, resulting in some great fights. However, especially if you've no previous experience boxing, the fittest boxer will likely win the majority of the time. Three 2-minute rounds doesn't sound like much, but in reality is absolutely exhausting. 8 weeks isn't enough to turn you into a pro boxer and as much as I tried to keep technique in mind on the night, inevitably a lot of it went out the window. Personally, I'd go into this with at least a reasonable base level of fitness, i.e. being able to comfortably bang out a 5K run. I'd done boxercise and HIT for over a year and the fitness I gained through this put me at an advantage. Be prepared for the most exhausting 6 minutes of your life; nothing I've done compares in terms of physical exertion. 8 weeks isn't a long time, but cutting out alcohol and eating as cleanly as possible made a noticeable difference, which I think helped on the night. Knowing you'll be fighting in front of friends and family, with an additional 1000+ people expecting a great fight is a serious motivator, plus after it's done it's a lifestyle change you'll want to keep up. With the money I saved on not drinking I invested in some PT sessions which also helped, but aren't necessary. Big thank you to James Bartram for the sessions and for the support and investment over the 8 weeks (and on the night), I'd highly recommend him if you're in the Brighton/Hove area and after a trainer. Find out more here. A good pair of boxing gloves are invaluable, as they'll protect your hands and last throughout the training sessions. Look for a pair constructed from leather and if possible check the fit and feel before you purchase. You'll need these if you plan on stepping in the ring and punching someone. Obvious. On the night every fighter uses UWCB-supplied 16oz gloves (which apparently feature extra padding over standard 16oz gloves), but I trained in 14oz gloves and didn't notice a difference — I wouldn't go lighter though. A decent pair of gloves is worth the investment — Sports Direct sell 16oz Lonsdale and Everlast boxing gloves for ~£20, but having tried them on they felt cheap and uncomfortable, lacked support and didn't feel like they'd protect my hands. 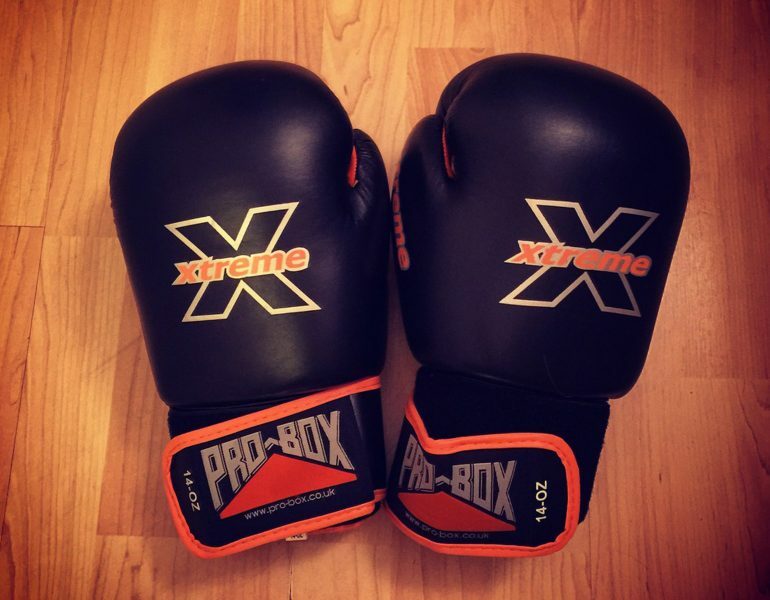 I spent a bit more on a pair of Pro Box Xtreme 14oz gloves and feel they're worth the ~£40. They still look as-new after dozens of heavy bag sessions, are made from quality materials and give your hands plenty of support and protection. Boxing boots will offer better ankle support and are mandatory in most boxing gyms for use in the ring. Not essential, and some guys wore trainers on the night, but most gyms (ours included) won't let you step foot in the ring unless you're either wearing boxing footwear or barefoot. 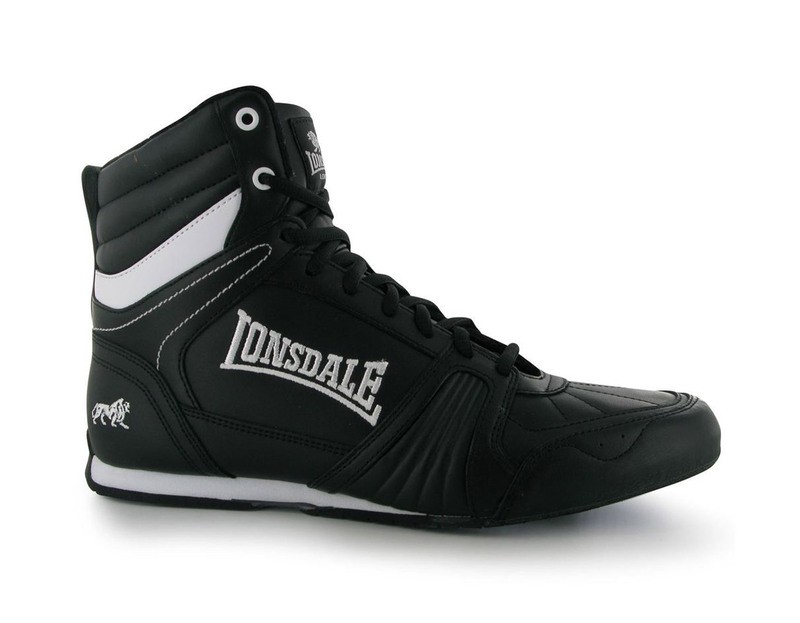 I spent £25 on these Lonsdale boots and they did the trick, so for me it's not worth paying much for a pair unless you're planning on using them regularly long-term. Essential for looking after your hands, plus you feel like a boxer when you wear them. Any wraps seem to do the trick so buy the cheapest you can find and replace them if they get too tatty. I used the same pair throughout, and developed a bad habit of rolling them up after a session and leaving them in my bag until the next time they were needed — grim. There are plenty of videos online showing you how to properly wrap your hands, but this was one of the first things we were shown before we began sparring. You can also wear the glove-style wraps as well. As with the gloves, pay a bit more and get a decent branded gum shield. These are mandatory on the night and the last thing you want to worry about is your gum shield falling out mid-round, so spend £10–15 and get a proper mouldable model, then make sure you get the fit spot on. You can trim the two ends down a touch if the length of the gum shield is uncomfortable. I'd also recommend training with your gum shield in as much as possible, both to get used to the fit and feel, but also breathing with one in. Browse more gum shields & mouthpieces here. Mandatory for sparring and again worth the investment, although at each sparring session our trainer turned up with spares. It's worth getting used to wearing one as they do impact your field of vision, plus the combination of wearing a gum shield with the chin strap makes breathing more difficult. I skimped on this and bought a £15 Lonsdale-branded head guard, and on opening it instantly regretted my decision — it was plastic/fake leather, looked and felt cheap and flimsy and wasn't particularly comfortable. That said, it did the job, but don't expect it to last. Again, as with the gloves you'll be using a UWCB supplied head guard on the night. The Pro Box Xtreme head guard comes highly rated, as does the RDX model. Browse more head guards here. As with most of the group, I didn't wear one until fight night, although on the night it's a mandatory requirement (you won't be allowed in the ring without one). I never saw a real low blow throughout training but it doesn't mean it's not worth buying your own and wearing it each time you spar. Browse groin protectors here. Historically the Brighton training has taken place at The Stables gym next to Brighton racecourse, which is where we had our initial meeting. Due to the number of people signing up to the March 2015 event it was decided that the training would switch to the The Underground Gym in Portslade. Perfect for me — I was already a member and it's a cracking gym (the best I've stepped in) with a full size ring and combat area. The volume of boxers also meant we were split into two groups, with two nights of boxing organised rather than the usual one. I chose to fight on the original date (Sunday 22nd March) and the group roughly split into two. Both groups then trained separately, with Sunday fighters training on a Thursday night and Sunday morning. The change in venue meant we were trained by Neil Wray, a blinding boxer and an absolute legend. Throughout the 8 weeks he kept training enjoyable and varied, and both himself and his team invested a tonne of energy and time in getting us to a level where we could demonstrate some boxing technique and skill on the big night in order to put on an entertaining fight. His team were also cornermen on the night and were invaluable throughout the fight. I had a shocker of a first round but my cornerman calmed me down and sent me out in round 2 with some advice and a game plan which helped me visibly settle into the fight. The Bring Sally Up press up challenge was another pretty intense exercise — watch the video and give it a go! Throughout the first four weeks we had a couple of brief introductions to sparring, but from week 4 onwards the sessions split into two — mid-week for fitness and conditioning, then the weekend session for sparring. Our group were split into roughly two 'weights' and we'd take it in turns to spar with a different partner for two minutes at a time. Having never done any combat sport, the first time you spar is an experience. I won't lie — I was pretty nervous at this point and combined with trying to remember the training so far meant some tough sparring sessions. I took a hiding around week 5 which definitely knocked me back. My advice would be to get some additional time in a ring with a friend or training partner and get used to rehearsing the basics. Keep your guard up, and focus on not looking away, something I found difficult at first but which gets easier with practice. Work on movement/head movement, defence and some hand drills. Rehearse a few combinations and take it in turns at offence and defence. As we sparred with different partners, the training team were observing, taking notes and gradually matching us up for the big night. It's vital to turn up to all of the sparring sessions as this ensured the fights were fair. Towards week 7 you begin to spar with a smaller group of guys, as the match-ups are narrowed down and became more obvious. At some point you will spar with the guy you eventually fight on the night. Myself and a friend booked a session with Neil around week 7 as a bit of a top-up and I felt this was well worth it, not only as a refresher, but as a chance to spar a few rounds with someone who really knows how to box. After spending 3–4 weeks pretty much waking up dreading the main event, I felt fairly calm on the day. We'd moved house the day before (unplanned) which wasn't the ideal preparation, but I didn't feel too bad on the morning. We turned up to the Grand Hotel around 1.30pm, and this is where the waiting starts. It was at this point that we finally found out the running order for the night, and if you're lucky you only have a few hours to wait (the show started around 4.00pm). If, like me, you were fight 12 of 15 or so, you're in for a long wait! Take some headphones, some food and some sweets for energy ~30mins before the fight. Stay hydrated and make use of the training team, who are there to warm up fighters on the pads before each fight. You'll have a briefing from the referee and St. John's will check your blood pressure. Mine was slightly high (unsurprising) and a couple of guys had to be re-checked for the same reason, but everyone was cleared to fight. The group was split into two (red and blue corners) and each corner given a dressing room to prepare. There's something pretty cool about wandering around a venue like the Grand in training gear, and prior to being split up we got a look at the ring and the empty venue (which soon filled up). Something I noticed is that the ring is fairly small, smaller than the ring we'd trained in. This might suit your style (I worried that I'd struggle as I tended to move around the outside a lot) but it didn't cross my mind again. Around two fights before you're up, it's time to get ready; head guard and gloves, gum shield and groin protector on. One fight before yours, you'll have a quick warm up on the pads and some last minute advice, then before you know it, the fight before you has finished, the runner has come to get you, you're stood in the hallway with your cornerman and it's time to make your entrance with the ring girls! Picking your ring music is a fun part of the whole process and I loved the ring walk. The atmosphere was absolutely electric, the crowd were buzzing and the whole thing makes you feel like a real fighter — ring girls, music, announcer, everything is done so well and it's the perfect build up. The fight itself was an incredible experience. The atmosphere from the crowd was amazing, and hearing 1000 people react when you connected is something else. I had a shocker of a first round, came out panicking and within 30 seconds had swung widely, lined up my feet and got knocked over. I wasn't hurt, but I remember panicking that the referee was going to stop the fight. I had a standing count and the ref checked my head guard, then it was game on. I lost the first round even without the knock down, but towards the end started to use my height and come forwards, landing some decent shots just before the bell. The second and third rounds were where fitness came into play — I was useless at holding the centre of the ring and tended to move around the outside a lot, which meant using up more energy than my opponent. The break between rounds had helped though, and I felt more relaxed, getting caught with a left hook which almost took my gum shield out, but feinting a jab to the body and following it with a right cross (probably my best moment of the fight). There's a temptation to go for the head, especially with head guards on, but some of the most effective shots I saw on the night were to the body. The final round was slower, as we were both visibly shattered. Knowing I needed to win the round or lose the fight, I tried to be more offensive. Towards the end of the round we were both exhausted, technique had gone out the window and we were swinging (and missing) pretty wildly, but the crowd were going nuts. The bell rang, we hugged it out and the sense of relief is something else — we'd got through the 8 weeks, I'd not been knocked out and we'd put on a decent fight. Job done. The fight was ruled a draw, a result I'm totally happy with. The guy I fought was actually my mate Olly — we'd signed up together and never intended to fight each other, but our weight group lost several guys and it was an ideal matchup. I don't think this had any impact on the fight; we both wanted to win and tried 100% to beat the other. People had paid to see us and friendship was put to one side for 6 minutes as we did our very best to beat each other. It was great fight, which you can watch here. This was without doubt the toughest, most exhausting and life-consuming process I've ever put myself through. I had my own reasons for signing up, including self-confidence and fitness, having spent a large part of my late teens/early twenties suffering with active Crohn's disease and complications, but the whole thing was just an incredible experience throughout. It's also for a fantastic cause, and between the three of us we raised well over £1000 for Cancer Research. UWCB know how to put on a hell of a show and in a way the fight itself is the reward for getting through the 8 weeks of training. If you're going to do it, commit to it 100% and you'll get the most out of it, but ultimately even if you lose, you've proved to everyone you can come through the training (the hardest part) and step up in front of 1000 people for charity, something the majority of the people in the crowd wouldn't put themselves through. A massive shout to Neil and his team for the training and support on the night, they were absolute professionals and it was great to have them in our corners. Would I do it again? Maybe. It was an amazing and hugely rewarding experience throughout and whilst I loved the night itself, I don't miss the pressure of the training and sparring sessions. UWCB will let you fight in two events, so the option is always there. If you've skimmed this, would I recommend it? Yes. 100%. Sign up, commit to the training and you'll be rewarded with one of the best experiences you could put yourself through.